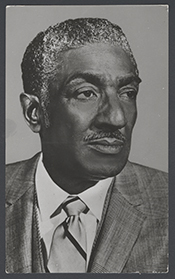 METCALFE, Ralph Harold, a Representative from Illinois; born in Atlanta, Fulton County, Ga., May 29, 1910; attended the Chicago public schools; Ph.B., Marquette University, Milwaukee, Wis., 1936; M.A., University of Southern California, 1939; member of the United States Olympic Team in 1932 and 1936; track coach and political science instructor, Xavier University, New Orleans, La., 1936-1942; served as first lieutenant in United States Army; received Legion of Merit for program planning as director of physical training; director, Department of Civil Rights for Commission on Human Relations, 1945; Illinois State Athletic Commissioner, 1949-1952; elected Democratic committeeman (Third Ward), 1952, 1956, 1960, 1964, and 1968; elected alderman in 1955, 1959, 1963, and 1967; elected president pro tempore, Chicago City Council, 1969; appointed by Vice President Hubert H. Humphrey, a member of the National A.A.U. and N.C.A.A. Sports Arbitration Board; former member, Chicago Planning Commission, 1964; member, Austin Committee to investigate the civil disturbance in Chicago following the assassination of Martin Luther King, Jr.; delegate to Illinois State Democratic conventions, 1953-1972; delegate to Democratic National Conventions, 1952-1972; member of the Presidents Commission on Olympic Sports, 1975-1977; elected as a Democrat to the Ninety-second and to the three succeeding Congresses and served from January 3, 1971, until his death October 10, 1978, in Chicago, Ill.; had been a successful candidate in the primary to the Ninety-sixth Congress; interment in Holy Sepulchre Cemetery, Worth, Ill.
Ralph Harold Metcalfe in Black Americans in Congress, 1870-2007. Prepared under the direction of the Committee on House Administration by the Office of History & Preservation, U. S. House of Representatives. Washington: Government Printing Office, 2008.